I should repeat some things mentioned at the beginning of my first post. I respect Dawkins as an excellent and inspiring evolutionary biologist. Although he misrepresents and misunderstands religion as a whole, he justifiably expresses anger and distrust regarding many particular aspects of religion. His view of religion is more black and white than mine; and, although sympathetic, I disagree with him. God is not always a delusion. "To talk of immaterial existence is to talk of nothings. To say that the human soul, angels, god, are immaterial, is to say they are nothings, or that there is no god, no angels, no soul ..."
"Whether we ever get to know them or not, there are very probably alien civilizations that are superhuman, to the point of being god-like in ways that exceed anything a theologian could possibly imagine. Their technical achievements would seem as supernatural to us as ours would seem to a Dark Age peasant transported to the twenty-first century. Imagine his response to a laptop computer, a mobile telephone, a hydrogen bomb or a jumbo jet. As Arthur C. Clarke put it, in his Third Law: 'Any sufficiently advanced technology is indistinguishable from magic.' The miracles wrought by our technology would have seemed to the ancients no less remarkable than the tales of Moses parting the waters, or Jesus walking upon them. The aliens of our SETI signal would be to us like gods, just as missionaries were treated as gods (and exploited the undeserved honour to the hilt) when they turned up in Stone Age cultures bearing guns, telescopes, matches, and almanacs predicting eclipses to the second. "In what sense, then, would the most advanced SETI aliens not be gods? In what sense would they be superhuman but not supernatural? In a very important sense, which goes to the heart of this book. The crucial difference between gods and god-like extraterrestrials lies not in their properties but in their provenance. Entities that are complex enough to be intelligent are products of an evolutionary process. No matter how god-like they may seem when we encounter them, they didn't start that way. 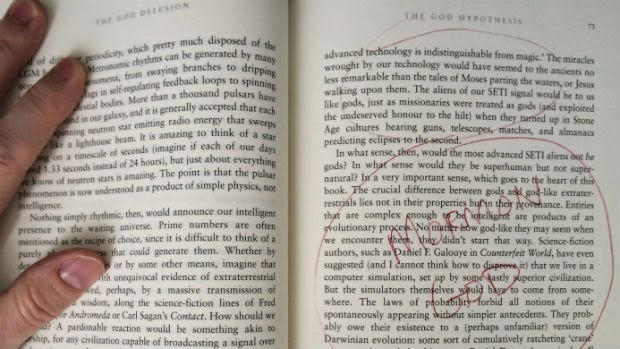 Science-fiction authors, such as Daniel F. Galouye in Counterfeit World, have even suggested (and I cannot think how to disprove it) that we live in a computer simulation, set up by some vastly superior civilization. But the simulators themselves would have to come from somewhere. The laws of probability forbid all notions of their spontaneously appearing without simpler antecedents. They probably owe their existence to a (perhaps unfamiliar) version of Darwinian evolution ..."
"Eternal progression" is what Mormons call that (perhaps unfamiliar) version of Darwinian evolution. "God" is what Mormons call those god-like extraterrestrials that didn't start that way. Whether we ever get to know them or not, there are very probably gods - at least, that's what Dawkins is telling Mormons, whether he intends so or not.